A Grown-Up Kind of Pretty is the saga of three generations. Every 15 years something happens to the Slocumb women. Ginny "Big" got pregnant with Liza when she was 15 years old. Liza also became a mother at 15 years old. Now that Mosey is 15, her grandmother "Big" and mother, Liza, are doing everything they can to break the cycle. The town even expects Mosey to be a teen mother like the generations before her, but Mosey is determined to prove them wrong. Liza suffered a stroke and is in recovery. Mother "Big" decides to cut down the willow tree in the backyard to install an outdoor pool for therapy. But what is found in the backyard turns the Slocumbs' lives upside down. A buried grave with a baby blanket is uncovered along with secrets of the women's shared past. At first I didn't feel a connection to the characters so it was hard to get into the book. But slowly as each chapter went on, I grew a little more interest in the story. I felt more sympathetic toward Liza because she was around my age (30 years old). The author Joshilyn Jackson did a great job relaying Liza's post-stroke recovery. I couldn't imagine how hard it must be learning how to speak again or feeling frustrated re-learning something you've done before. Not being able to express your thoughts aloud must be awful. What's worse is not being able to tell your mother thank you for being loving, protective and a "mommishy mom." I also sympathized with Mosey. Imagine a whole town of Southern Baptists just waiting for you to screw up. Think how difficult it must be with your grandmother and mother sheltering you so you won't end up making the same mistakes they did. Unlike other teenagers, she had to work extra hard to prove herself. She also had to be careful not to be such a "grown-up kind of pretty." And to top it all off, she has to figure out who she is and how she belongs in the family. 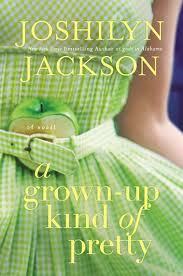 A Grown-Up Kind of Pretty was not the page-turner I hoped it would be. Most family sagas play out with more detail and mystery. While I did feel the characters were well-developed, they will not stay with me as memorable characters usually do. There were also a few passages that I had to re-read in order to grasp what secret or flashback the author was trying to tell. Despite this review, I'm not opposed to reading other books by Joshilyn Jackson.